When I was young, I hated tomatoes. Can you believe it? How could anyone hate tomatoes? I don’t know, I’m guessing it was a whole texture issue. My mother used to grow them and I hated the smell of the plants too. Now, that smell just makes me swoon over the deliciousness that I know is coming from a plant like that. Loving tomatoes like I do now, you’d think I’d love gazpacho, BUT I can’t stand gazpacho that just tastes like you’re eating salsa. Like, excuse me but can I have chips instead of a spoon? That type of gazpacho can be so thick it can almost make you gag. Are you in agreement with me here? Now this is the best gazpacho recipe! It’s fast, easy and healthy to boot. Made with super sweet sunny gold tomatoes, it’s practically just pure pureed tomatoes, topped with some luscious avocado chunks and you have summer in a bowl! Make this now while those sunny golds are flooding the farmers market stands and avocados are perfectly ripe and plentiful. This is super simple and so delicious. I hope you enjoy it just as much as we do. The basis of this recipe came from the August issue of Food and Wine magazine, but I have changed it up a bit – less water than they originally call for (who wants to dilute the sweetness of these tomatoes?) and more spice by including the seeds from the jalapeño. 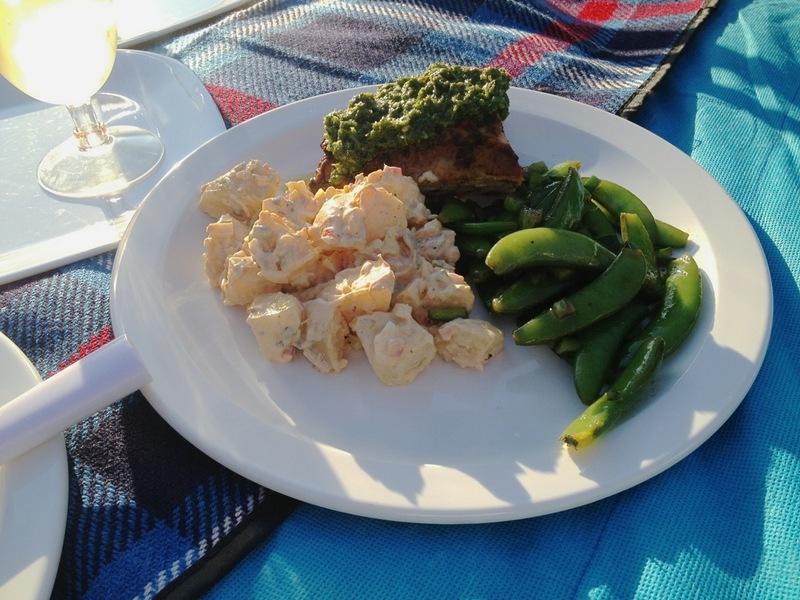 But a big thank you to Justin Chapple and Food and Wine for providing the inspiration and foundation of this wonderful summer starter dish! In a food processor, puree the tomatoes, crushed garlic and jalapeño with 2 Tbs. of water. With the machine on, gradually add the olive oil until incorporated. Transfer to a bowl and season with salt and pepper. Refrigerate until chilled, about 30 minutes. 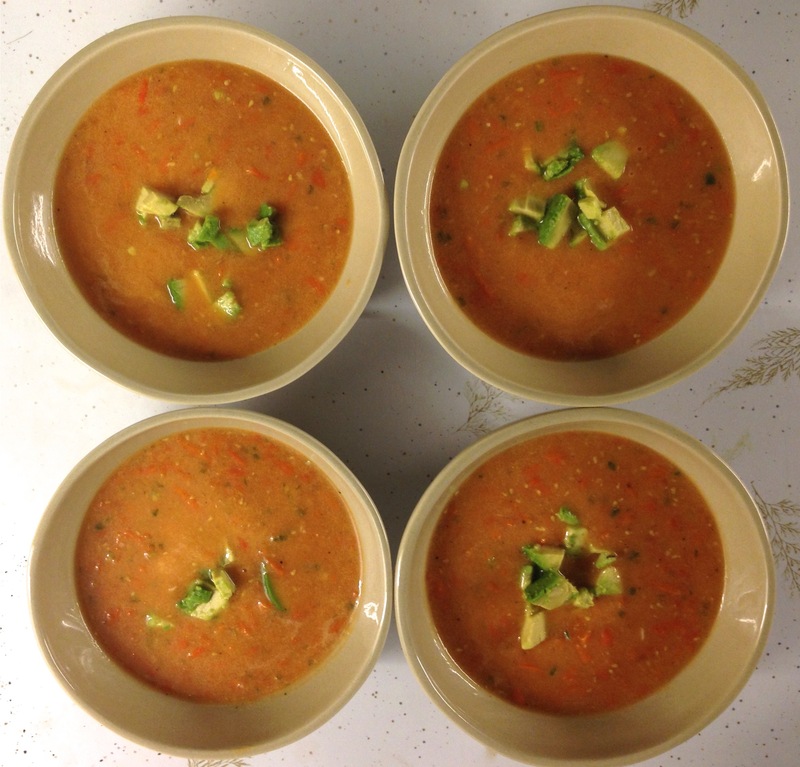 Ladle the gazpacho into bowls, top with diced avocado, and serve with LOVE. The gazpacho can be made ahead and refrigerated overnight. We love being invited to our friends Susan and Matt’s apartment for dinner. They are both great hosts. Susan always does a terrific job making special recipes, Matt always serves a wonderful single malt Scotch and our conversations are topical and stimulating, often revolving around politics. 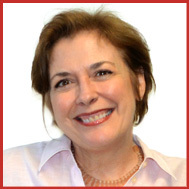 Susan worked closely for a state senator for many years and really knows the ins and outs of the system. 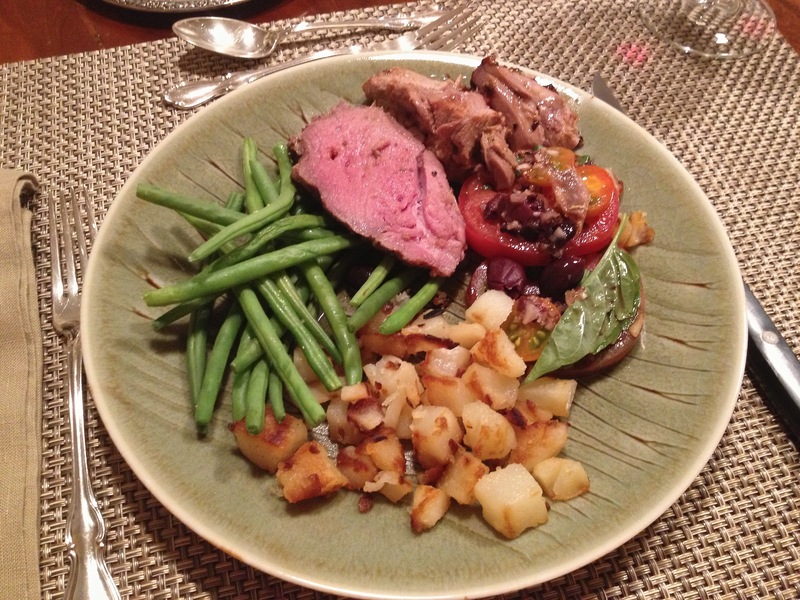 This past week, we were invited there along with some old friends of theirs and Susan made the most amazing leg of lamb. 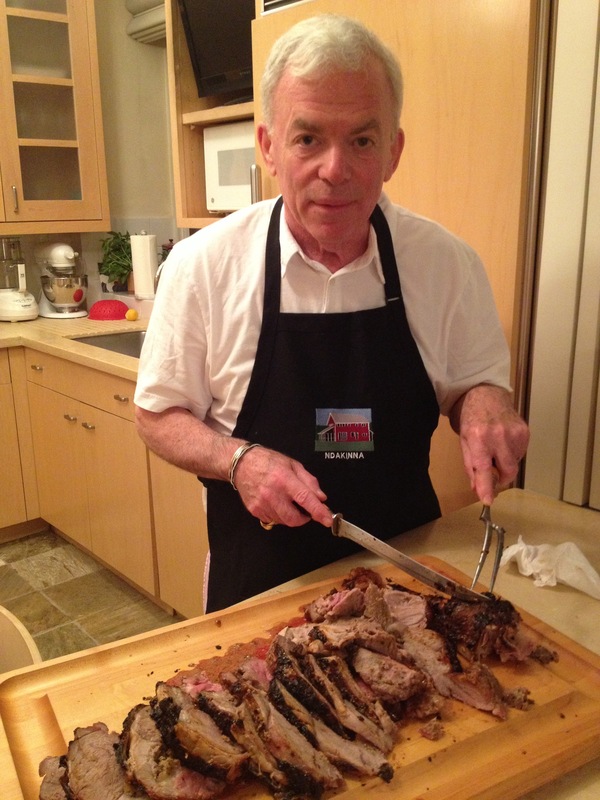 It was Herb and Honey Mustard Crusted Leg of Lamb from the September issue of Food and Wine magazine. But listen to this story – this is the great thing about living near an old fashioned butcher. The recipe calls for a boneless or butterflied leg of lamb, seasoned with the mustard paste, rolled and tied back up to form a roast, and then to put the bone back in the one end so it looks pretty. Her butcher, Frank at Ottomanelli on York Avenue and 82nd St. would be happy to butterfly it, but then she was nervous about tying it back up. No worries, Frank told her to bring her herb mustard mixture in to the store and he would spread it all around on the inside, salt and pepper it, and tie it back up all pretty, making a gorgeous roast and putting the decorative bone back in. Isn’t that the sweetest? So she arrived home all set to put this baby in the oven. Done! TIP: I have found that most butchers in independent shops love to offer to do this type of work. They take ownership in their work, have a lot of pride in what they do and want to be a part of your meal. So next time, let them know what you’re trying to do and just ask! Now I stupidly neglected to take a picture of the whole roast but here’s one of Matt cutting Susan’s beautiful and scrumptious leg of lamb. And here’s the recipe for the delicious tomatoes. You know I love anchovies!! Slice red tomatoes thickly and place on platter in one layer. Season with salt and pepper. Season cherry tomatoes with salt and dress with vinaigrette. Spoon cherry tomatoes over tomato slices. Top each tomato slice with half an anchovy fillet, sprinkle with capers. Garnish with basil leaves and whole olives. Serve at cool room temperature. Here is this mayonnaise based recipe, with some different instructions on how to handle the potatoes, making sure you chill it ahead of time, and yet let it come close to room temperature before you serve it. Wash and scrub potatoes. Place in a large pot and cover with cold water by 1 inch. Salt the water with coarse sea salt and bring to a boil. Turn down heat to a simmer, partially cover and check in 20 minutes. This will take 20-30 minutes and the potatoes should be tender when tested with a skewer, but not fall apart. Drain in a colander until cool enough to handle. This will take some time so be patient. 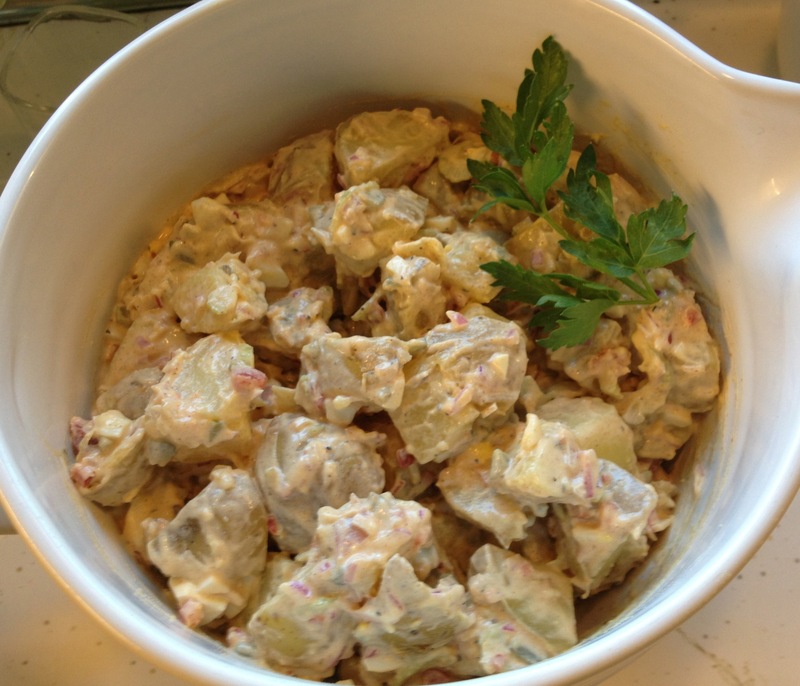 You do not want to cut warm potatoes as they will fall apart and you do not want to put this dressing on warm potatoes. Combine all other ingredients into your dressing. Do not peel the potatoes, cut them into 3/4” pieces and place in a pretty bowl. Distribute all the dressing, carefully folding it over with a spatula until evenly distributed. Chill at least one hour before serving and take out at least 1/2 hour before your meal, so it’s not so cold. This tastes even better the next day. Our plate! That’s a sugar snap pea salad with poblano peppers and a balsamic vinaigrette. 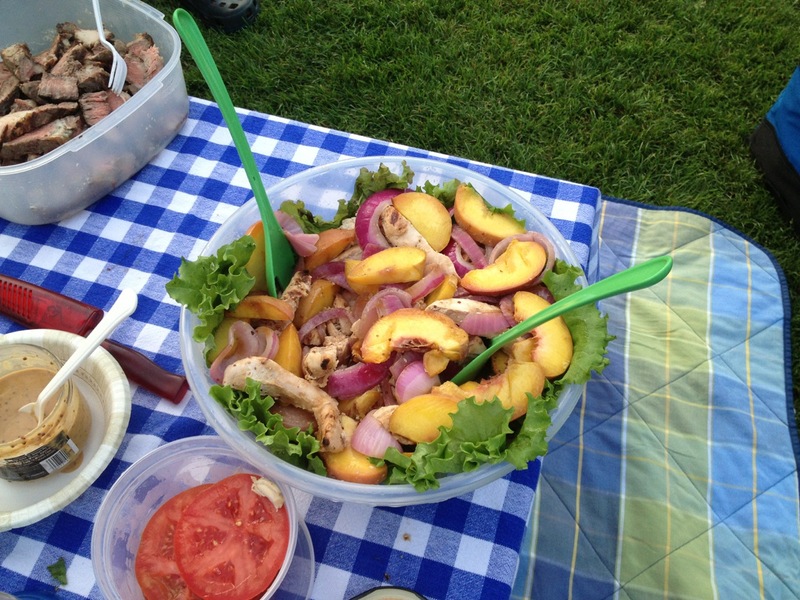 Our neighbors behind us had this beautiful salad with grilled peaches and chicken on her garden lettuce. I commented on how pretty it was. My new friend, Jan gave me a big taste. She was so sweet and she said I made her day. I think she made mine. Her salad dressing was so interesting – one whole grilled peach (skinned and pitted) with some grainy mustard and olive oil – puree it all in a food processor. It was delicious!! The sweetness of the peaches offset the vinegar in the mustard, which was really a nice combination. Thank you Jan! That’s a great idea. 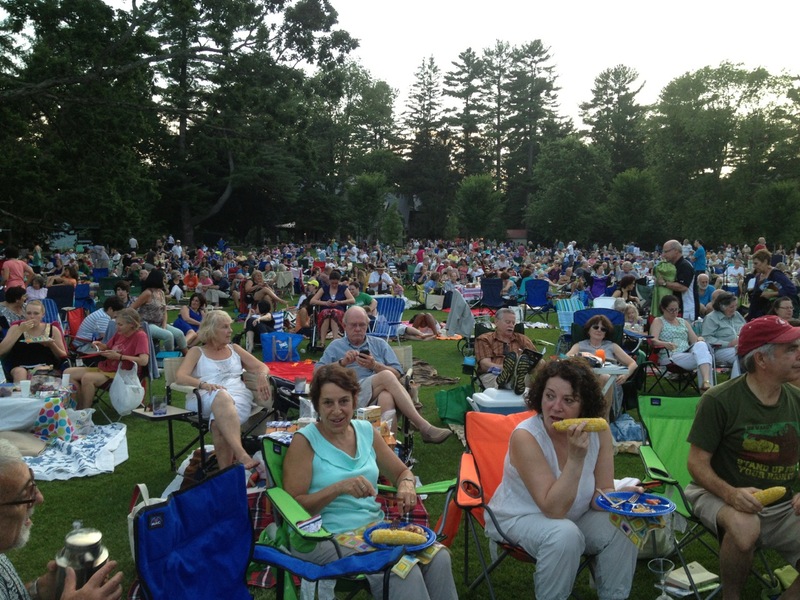 There’s Jan in the mint green shirt – and some of the Tanglewood audience behind us. Just look at this cute loving couple in front of us. 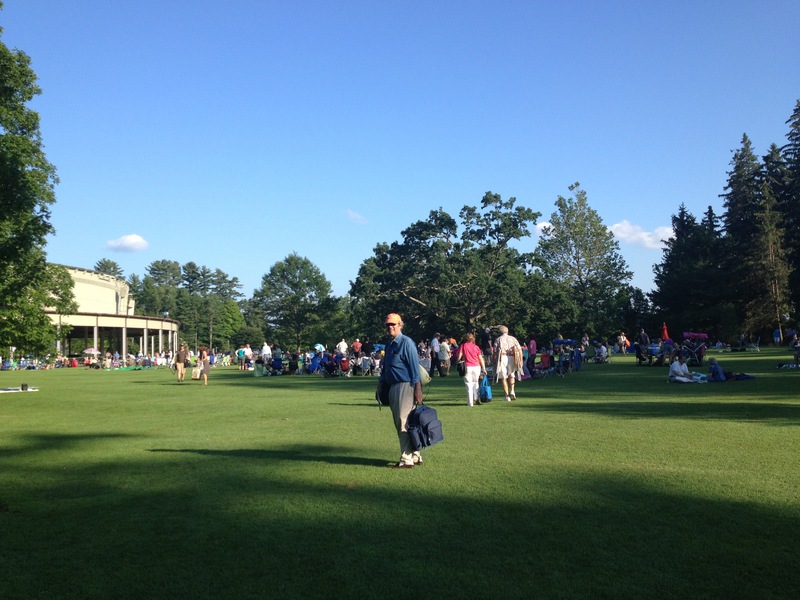 This is the Boston Symphony Orchestra playing an All-Tchaikovsky Program – Violin Concerto and Symphony No. 5 – Rafael Frühbeck de Burgos, conductor, Joshua Bell, violin. It was magnificent!! I am still basking in the glow – of being treated like a queen! My boys made me the most amazing dinner on Sunday night. My mouth is still open in awe. Recipes were made that I wouldn’t even attempt. The whole meal, including cocktails, wine and dessert, planned to perfection, made and served with love. I am so, so lucky. When I arrived home, I was greeted with hugs and flowers and told to shower. Zach said I definitely smelled like a bike ride. (nice!) I’m sure I did. After the bath, perfectly chilled martini glasses appeared, with all the proper frost, and Vespers were poured. A drink made with vodka, Gordon’s gin, Lillet and lemon. Divine. Here is our first course – a drop dead gorgeous presentation!! (They even pulled out the sterling!) This is a recipe from Thomas Keller’s The French Laundry cookbook. I have looked at that book and decided the recipes were too much work and too precious for my style, yet my oldest son uses it a lot! He made a homemade poaching liquid and poached the shrimp, leaving them in the liquid overnight. (so this was a two day affair) Then split them, serving them on the edge of the fork with a small mound of avocado, red onion and cucumber deliciousness. A small bite, perfect with the Vesper. The shrimp were so yummy, infused with flavor from the poaching liquid and sublime in texture. Really, this amount of time spent, I have to admit, is worth it. They tasted similar to the amazing poached salmon at Aquavit, a 4 star Swedish restaurant here in NYC. Next course was a homemade spicy gazpacho, again, the recipe from the French Laundry, pureed moments before and served in a small glass, with a glass of Vouvray, one of my favorite wines and perfect with the soup. The soup sparkled with freshness, a riot of flavor in your mouth, with the perfect amount of kick from the jalapenos. Now for the main course, it was potato crusted halibut served with a skillet ratatouille. It was amazing!!! Zach said he watched a video on Food Network on how to coat the fish with the potatoes and that it really took the two of them to do it, needing 3 or 4 hands, and boy did they do it properly. They were beautiful, as you can see! The fish was then sautéed in olive oil that he had infused with garlic, fennel seeds, bay leaves, fresh thyme and lemon zest from a whole lemon. It was so delicious! Crispy and moist all at the same time. The skillet ratatouille was spectacular – the fresh flavors all melding together – it was really, really yummy. This recipe was from Food and Wine. We had the leftovers for lunch yesterday and it was still spectacular! And now for dessert. They even did dessert!! Well, sort of. My oldest son’s girlfriend was so sweet, she made a really beautiful and delicious pear upside down cake on Saturday night, the recipe from Smitten Kitchen. Yes, you know it had a lot of butter in it and it was darn good!!! Just look at this beautiful cake! We ended our evening together watching MadMen, a very perfect day with my boys and husband. I hope all you moms out there had a fabulous Mother’s Day, I’m sure filled with LOVE as well!! So how was your Thanksgiving? Ours was fantastic! My family said our dinner was the best ever. But then they seem to say that every year I cook, so I guess I keep on improving? But truly, they’re still giving me compliments today so I guess it was really, really good! I was particularly pleased this year with our appetizers. They were different and just the right touch, pre-feast. I made two recipes from Food and Wine magazine. One was for Texas smoked salmon tartare and grilled pancetta-wrapped mushrooms along with my artichoke dip. You can make the smoked salmon tartare and the artichoke dip the day before. I also had help. Agata made all of the mushrooms while I assembled the tartare on the chips with a cilantro leaf each. It was easy! My butternut squash soup was the best ever, I’m told. See this quick pic of the kids licking their bowls – seriously I did not ask them to do this for a photo op! This soup is based on David Waltuck’s recipe of Chanterelle fame, except that I have made my own revisions. One important one is that instead of cooking the squash by simmering it in the chicken broth, I oven roasted it at 425 degrees and then scooped it out of the skin to add to the broth and onions. Much tastier and you skip that difficult-to-peel step that makes your hands all wrinkly. I also made two pies this year. One pecan and one pumpkin, from a fresh sugar pumpkin I roasted with the squash and then let it drain for several hours through four layers of cheesecloth. You need to do that to get all the water out and get to the true pumpkin flavor. The pie was so light and yummy!! Definitely give that a try. I hope you enjoyed a delicious Thanksgiving, full of good family times, providing you with sweet memories to last the year through. 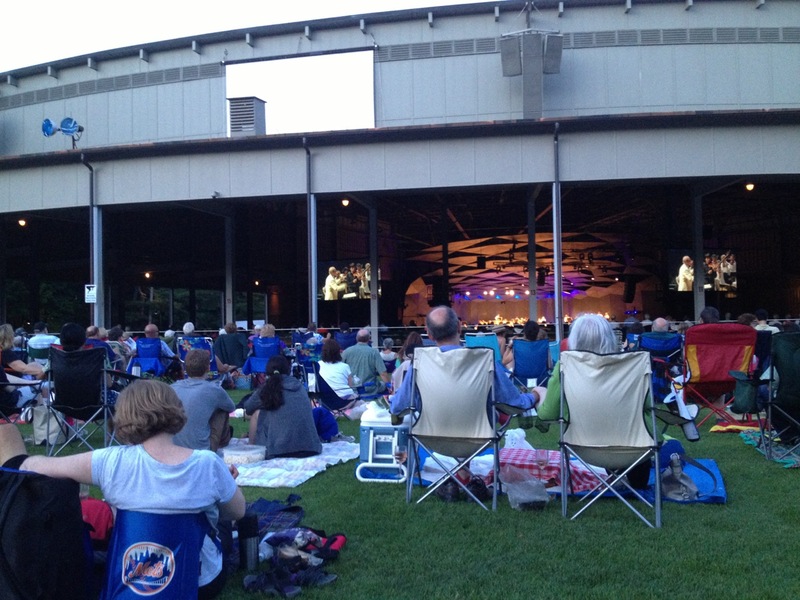 The end to a lovely day. We’re a nervous wreck here. The race for the presidency of our country is close. I made a lovely light dinner. (I’ll tell you more about that later.) And now I made a famous Spanish dessert, a favorite for children as a simple after school snack. We served it at a small dinner party this past Saturday night, and liked it so much that we wanted to keep on repeating it and repeating it. It’s simple to make and just the right amount of sweetness, of chocolate and a little bit of saltiness. And, it’s lovely with some red wine leftover from dinner. The basis of this recipe is from Food and Wine magazine. Use the best chocolate you can find. I used Scharffen Berger 3 oz bars. Buy two bars and put 2 squares on each bread slice. Preheat the broiler and position a rack 8 inches from the heat. Spread the baguette slices on a baking sheet and broil until toasted, about 30 seconds – 1 minute. Turn the slices over and set a square or two of chocolate on each one. Broil just until the bread is golden and the chocolate is beginning to melt (about 30 seconds – 1 minute). 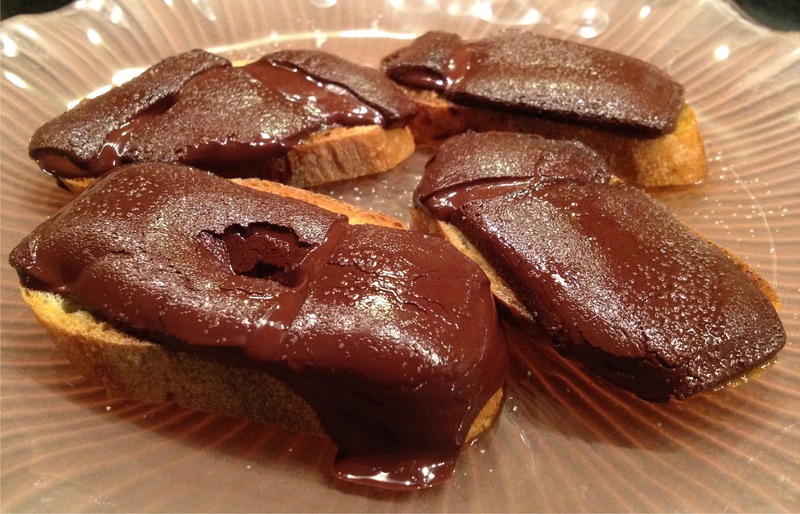 Transfer the chocolate toasts to plates and drizzle lightly with the olive oil and also sprinkle lightly with the sea salt on the chocolate. Serve right away.